After I had decided to go abroad for semester, the most popular question was “Why Morocco?” Having been to Morocco twice before, I still did not have a way to adequately explain the magnetic draw of the country. After spending an additional two months here, I have settled on the Hannah Montana lyrics, “You get the best of both worlds!” Morocco is the perfect mix of familiar Western culture and new and challenging experiences. One major facet of studying abroad for a semester is the ability to travel to places outside of your host city. 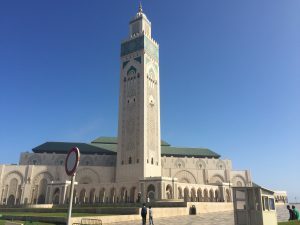 Though I live in the small community of Meknes, I’m just a three dollar train ticket from the bustling city of Fes, a couple hours from the industrial city of Casablanca, and a solid-nap’s length away from the capital, Rabat. The diversity within the country is amazing. You can see heavily European influenced cities, like Tangier with its Spanish architecture, and smaller more traditional towns, like Chefchaouen the blue city. But not only is it easy to travel around the country, there are a few major airports that run cheap and short flights to Europe. This past weekend, I was able to hop up to Italy to spend a couple days eating and touring Rome. The proximity to Europe means I can briefly experience those cultures as well as immersing myself into the Moroccan one. Even though Europe is just a ferry or plane ride away, Morocco maintains a unique and fascinating culture. As a student of both Middle Eastern Politics and Arabic language, this is one of the best places for me to be right now. I am using my language skills, both standard and dialect, daily through 12 hours of Arabic classes each week and interacting with my community. Moroccans are much more community focused that the US or even Europe; when greeting someone, they always ask if “everything is good?” and “how is your family doing?” The influence of Islam runs deep in their culture, extending the love of peace and fellow humans to daily interactions. Saying hello and catching up quickly with the door attendants and shop owners has become a daily routine here. The hospitality and compassion extends past just short interactions; my Moroccan professors go out of their way to help and welcome us. One of my professors drove some of my peers to the train station after class one Friday to ensure they made it to the beach on time. My art professor made our class an enormous pot of couscous one Saturday and invited us to come and bond as a class. We sat around a large table and ate the Moroccan style – straight out of the pot with our hands. It was delicious and messy! I am so grateful that I chose this beautiful and welcoming country in which to spend my semester. I have the creature comforts I need (like the occasional trip to KFC or McDonald’s) but I most importantly have the opportunity to immerse myself into a culture that pushed me to be a kinder and more generous person while practicing my Arabic and making lifelong friends. 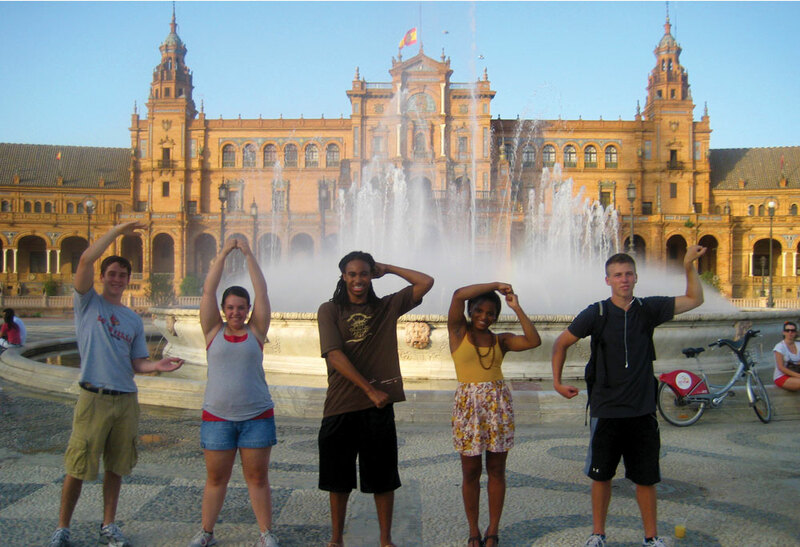 There are a lot of different programs that you can choose from for study abroad. I think it will be beneficial for you to read over my unique program. 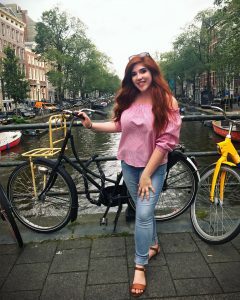 This past summer, I studied abroad in the Netherlands. My program was hosted by Maastricht University, ranked in the top 100 for the best universities in the world by Forbes. My classes were unique, one was an economics class with a focus in culture and case studies. In order for this mix to work, the class took me from the Netherlands, to Germany, Belgium, Luxembourg, France, and England. We visited some of the biggest companies in the world and were able to ask them all kinds of questions. 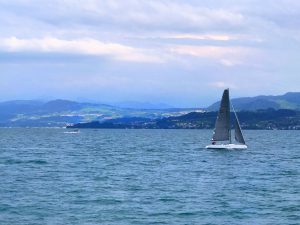 Some of these company visits included the headquarters of Bayer and Bayer, Google, and Deloitte Consulting (more is listed at the bottom of the post). We got to see the culture and operations that these companies implemented; which made me decide that I would love to incorporate a European environment for teams to thrive in. I think the way that teams work over there is inspiring. All of the desks face each other, there are lounges for the team members to eat together, Google had a board game room for their employees to play and share ideas in. Almost every company provided some type of entertainment and health center to their employees, which I think improves moral for everyone. 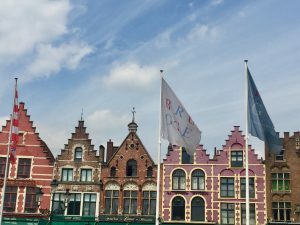 While in these countries I also had the opportunity to talk with local artisans in Paris, walk in the tunnels under Maastricht City in the Netherlands, swim in Zurich Lake in Switzerland, have a champagne tasting at Pommery Champagne in Reims, France, along with so many other incredible experiences. Zurich, Switzerland (Weekend Trip: Boat tour, river swimming) This is also where I had my favorite meal out of the whole trip, Fondue at Le Dézaley. When abroad there were some apps I wish I had known about while I had Wi-Fi back in the States. The apps listed in this post will be incredibly beneficial to you because they will minimize your stress levels and allow you to transition more easily into the culture you are about to immerse yourself in. I recommend you download these before your departure, because Wi-Fi is not always easy to find abroad. Download the app of whichever company you buy your flights with. Usually these apps will have your flight ticket already downloaded on them, this makes the flight process less stressful. This app comes in handy when you are reading signs, menus, or trying to understand what products to by at the grocery. You just hold your phones camera over a piece of text and it will transform the words in front of your eyes – no data required! If you do not know the native language of whatever country you are going to, or plan on traveling to many countries with different languages, Google Translate is a must, there is not way around it. You will get lost without this app, no question. This offers a downloadable map for virtually any city or place you may visit. It will include restaurants, and can tell you the quickest route to use to get somewhere you need! No data required, but it eats up battery power like no other! It is likely that you may have to bum some money off of others, or the other way around while abroad. A lot of places only take cash, and ATMs are scare, so this happened to me A LOT. XE Currency easily converts any type of currency into another with the exchange rates applied – so you will be able to Venmo your friend the amount you need to, or they can send you the funds you loaned them. Travelex made it easy for me to convert USD into euros. The card acts as a prepaid debit card and you can convert USD into any type of currency you need (except the Swiss Franc.) You can get this card at virtually any airport, and the process is pretty quick and easy. Just watch out for the fees once you get back! If you get these apps, you will have an easier transition into whichever country you go to. Other students on my trip showed me these and it was honestly life changing. Be sure to clear out old pictures or unused apps, it is important to have memory so that you can document your trip and have room for these very important apps on your trip. Even though these apps will reduce problems you have while abroad, be sure to welcome mistakes and take away lessons from these. The trips you will embark on will test your independence, and you will learn a lot from those experiences. I have been living and studying in Madrid, Spain now for a little over two months. These two months have been some of the best of my life! However, the best thing I have done since being here is not stay in Madrid the whole time. While I love Madrid, and it is definitely my favorite city in Spain, it is important to get out of your comfort zone. Since being in Europe, I have traveled almost every weekend and have seen many beautiful cities across Spain and the entirety of Europe. Below, I will list a few of my favorites and share my experiences in these places with you! Tangier was special to me because I have never been anywhere like it. The culture is completely different from what I am used to back in the U.S. and even to Spain. I went to Tangier with a large group of students, we took a ferry from Tarifa, Spain into the Tangier port. I was so excited to go because I would finally be able to say I have been to Africa. When we arrived, my first impression was the heat and the dress of the people. Most of the men wear kaftans, which are robe like garments that are surprisingly cool and comfortable (I know because I ended up buying one and wearing it the whole time), and the women are mostly covered up. While in Tangier we did a number of interesting things. We rode camels on the beach, rode horses on the beach at 3 AM, toured the entire city, went to the beach, went to the central market, saw the Cave of Hercules, and ate traditional Moroccan meals. Overall, if you want to experience a completely different lifestyle, I would recommend Morocco. Probably my favorite place I have been so far. Amsterdam is like another world, I have never been anywhere like it. I went with a group of friends to attend a music festival and had the time of my life. There is so much to do in Amsterdam it is almost overwhelming, I wish I could have stayed longer than 3 days. Whatever it is you choose to do in Amsterdam, you can’t go wrong. 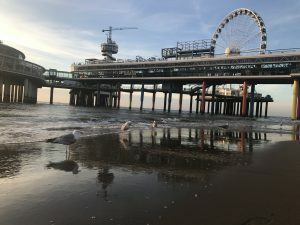 Whether you visit the Rijksmuseum or any other of the hundreds of museums, take a boat ride on the canals, go to the beautiful parks, experience the vibrant nightlife, or just walk around the city Amsterdam has so much to offer. The people are wonderful and so welcoming, you can talk to anyone. The only downside to Amsterdam would be the unpredictable weather, one minute the sun is shining and it is beautiful, the next it is pouring rain and the sky is grey. However, this is a small price to pay to experience such a great city. I have to include a city from my home country and Barcelona is a great choice. I have been to Barcelona twice already and am planning to go once more for Halloween. There is something about Barcelona that makes it an incredibly attractive city. Besides the beautiful architecture and the sightseeing, Barcelona offers beautiful beaches, an incredible diverse mixture of people, and a great night life for young people. If I were to live anywhere in Spain besides Madrid, I would definitely pick Barcelona. I have met so many amazing people that live in Barcelona that it makes it incredibly easy for me to visit and stay with friends at any time. It is also not incredibly far from Madrid and relatively inexpensive. I was actually in Barcelona for the Referendum, when Catalonia voted to succeed from Spain. That was an incredible experience and one I will never forget! I would definitely recommend anyone who studies abroad to get out of your comfort zone, meet as many people as possible and travel as often as possible. It allows you to experience so many cultures and really opens your eyes to the entire world! While the dining habits are not too different from the US, it was one of my favorite things about my time abroad. To start off my day, I would typically just have toast and coffee. But, lunch was interesting; this was my biggest meal of the day and took place around 2 in the afternoon. Lunch was typically prepared by the grandmother/mother and they would prepare enough for their entire immediate family. I appreciated this so much, because for just an hour a day they got to enjoy the company of their family. And obviously after eating this huge lunch I would not want another big meal. So, dinner typically consisted of tapas, which is a shareable appetizer, and this was eaten around 10 at night. In addition, some helpful tips I would like to mention is that bread was served with almost every meal and it was used to get all the little bits of food on my fork and I used a fork and knife for almost everything that I ate. At first this may not seem very appealing, but it allows you to really get to know your city. It gave me the opportunity to explore, get lost, hid from the sun, meet new people, and find new places. Sevilla is a big city in Spain, but a small city compared to Louisville, so I could walk everywhere. Not only did this allow me to burn off all those extra calories from the sangria, but it played a huge role in my love for Sevilla. And It is the reason I now call Sevilla my second home. People have friends from all the different chapters in their lives. I have friends from home, elementary school, middle school, high school, college, sports, work, etc. And there is study abroad friends too. Meeting new people who are doing the same new thing you are doing is very comforting. They do not know what is going on either. You will struggle together. You will learn together. But, most importantly, you will succeed together. I meet students from all over the US and I am lucky to call some of them my friends. They were there to help me communicate, they were there when I did not want to go shopping alone, they were there when I wanted someone to eat gelato with, and I know they will be there if we ever cross paths again in the future. When you study abroad your destination will be like a second home. It needs to feel like a home away from home and the only thing that will be this is family. Never forget about the people that love you back home, but you need that same loving support abroad too. While abroad, my family consisted of my home-stay mom, my roommate, and a few of my classmates. But, families abroad can come from anywhere. They could be a program leader, a professor, a classmate, a roommate, a waiter, a member of a home-stay family, etc. 38 days, 10 cities, 4 countries, 2 continents, and 1 trip of a life time, this is the opportunity the University of Louisville College of Business gave me. And now I am going to give back by giving my advice to the future students who wish to study abroad. Before you go abroad you have to make sure you are able to go abroad. By this I mean fill out all the forms, send out all your emails, pay all the fees, get all the immunizations, and ask all those questions that keep popping up in your head. I think the worst part for me was the anticipation leading up to my departure date. Yes, this means after you completed all those annoying requirements you still have to wait for the date printed on that costly plane ticket. But, you can use this to your advantage. Take the time to brush up or learn the native language of the country or countries you will be living in or visiting. And, if you are feeling brave you could even start packing or at least making of list of everything you plan to pack, that way when the time finally arrives you do will not forget anything you meant to bring. Also, this is the 21st century, you are going to want to take pictures and virtually communicate with your new family and friends so make sure you have memory on your phone/ camera. And personally, I would recommend that you have some kind of international plan (I saw students who were solely relying on WIFI and it looked frustrating). And speaking of new friends and family know that they exist. You will make friends. There will be other students going through exactly what you are going through. If you are having a hard time or just need someone lean on them because more likely than not, they need someone to lean on too. And you will have a family, it may be very non-traditional, but you will have one. Families abroad can consist of an assortment of people; they could consist of program leaders, professors, classmates, roommates, waiters, members of a homestay family, you name it. If they live in your new home away from home they could be a part of your new family. And before you go make sure you have a way to remain in contact with your new friends and family; friend them on Facebook, follow them on Instagram, send them pictures via Snapchat, or tweet them on Twitter. You can use whichever social media platform or platforms you like best, but definitely use them. And last but not least, know that “over there” where ever that may be is not so different than “over here”. You will live, you will make friends, you will go shopping, you will go out to eat, you will go out for drinks, you will get into a routine, and you will never truly be alone. I wish you good luck on your future endeavors and remember the world is too big to stay in one place. My name is Claire Gothard and I’m a junior Economics and Political Science major at UofL. I’m spending this fall semester in Morocco to work on my Arabic language skills and immerse myself into new experience. 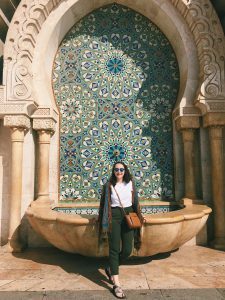 A little background on me, I’ve traveled to Morocco twice before to learn Arabic. Both of those visits were for about a month and I was living in Rabat, the capital city. Rabat is an international city, full of diplomats and other foreign workers. This semester, I am spending three months in the smaller, more traditional city of Meknes. 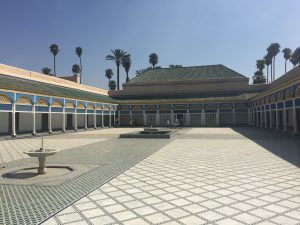 In this entry, I’ll tell y’all a little about a couple of the many cities in Morocco. This time, I am exploring the country with a group of amazing students from all across the States. My program through ISA has set up so many amazing opportunities for me to bond with both my fellow students, but also some local students. We all have varying levels of the languages spoken here: French, Modern Standard Arabic, and Darija (the Moroccan dialect). Navigating in each city is a trial of its own! We started the journey in Casablanca, the New York City of Morocco. It’s big, loud, and industrial. It’s home to not only the largest mosque in Africa, but also the largest shopping mall (2 million square feet). The hallmark event of our short visit was a tour of the Hassan II Mosque. Typically, non-Muslims are not allowed inside of mosques, especially during prayer time. We were lucky to be able to walk around the inside of the monumental building. Our group had time to explore the magnificent mosaics then hear a presentation on the internal décor and structure. After being impressed by the enormity of Casablanca, we took a long bus ride to the red city, Marrakech. As the largest tourist destination in the country, Marrakech is full of both Western amenities (Starbucks and McDonalds) and traditional vibes. The red city, called such due to the red clay buildings, is most famous for the large square Jemaa el-Fna that is the entrance to the souq, the outdoor maze-like market. 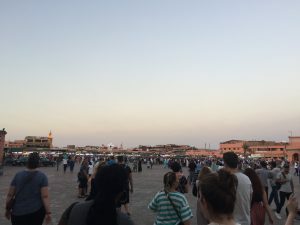 A group of us spent our first evening getting lost (purposefully and not-so-purposefully) in the never-ending alleys and corridors of the Marrakechi souq. We eventually ended up at a rooftop café with a gorgeous view of the souq. We ate traditional Moroccan tagine (stew) and mint tea. After those amazing, but all too short, adventures, we started the long journey to Meknes. I’ll save the wonderful descriptions of my home city for another time. Jemaa al-Fna, Marrakechi square full of juice stands, snake charmers, and other vendors. Morocco is constantly surprising me – it’s an entirely new experience each time. Yesterday, I completed my first full month here. Time has honestly flown by! And while I can’t wait for all of the adventures to come, I don’t want them to go by too quickly. Until next time!